If you're not part of a local radio club with members involved in HF contesting, consider joining one. Besides being able to draw upon the expertise of other amateurs, some projects such as those involving antennas and cabling can be made easier when others help out. Enthusiasm begets enthusiasm, and many clubs encourage contest participation with inter-club competitions and club awards for contest activity. One place to find a club is the ARRL Contest Club List. Clubs on the list submit or intend to submit contest logs for ARRL contests. The upcoming ARRL International DX Contests are great opportunities to work a lot of DX for fun or to increase your DXCC totals. In this contest multipliers count per band, and the DX stations will only be looking for US and Canadian stations. Complete information for all contests follows the Conversation section. Gary, ZL2IFB, writes: "You might spare a paragraph for the annual DX challenges - in particular the CQ DX Marathon and others such as the CDXC DX Marathon Challenge and of course the ARRL International Grid Chase. These are year-long competitions, akin to running marathons as opposed to sprints. The idea is to work the world in the course of the calendar year. Unlike the frantic dash to make QSOs in the few hours of a typical contest, the challenges are more laid-back affairs, but no less competitive. Whenever fresh meat appears on the bands in the form of a new DXpedition or other exotica such as Monk Apollo and 4U1UN, challenge entrants gunning for a podium finish are usually among the first to work them just in case they quickly go QRT (as happened to TT8KO). Challengers also participate in contests to fill empty band-mode slots or simply for the fun of it. Most of the year, though, is spent in regular DXing, chatting with pals and other challenge entrants in the friendly global DX community. Being global affairs, there are mini-challenges-within-challenges to win individual modes, bands, continents, countries and clubs. There is plenty of room for QRPers, remote station ops, conventional contesters, corporate slaves, HOA cave-dwellers and others. Club Log makes it easy to track and motivate performance during the year. Have you got the stamina to make it to the finish line?" Tim, K3LR, writes: "I am pleased to announce that Dr. Tamitha Skov, WX6SWW has joined the faculty for our 2019 Contest University in Dayton this coming May. Dr. Skov will speak about [Solar] Cycle 25 forecasting in the morning and she will lead a small group discussion about Space Weather in the afternoon. Tamitha is a regular part of the popular Ham Nation show on Wednesdays. Here is her latest Space Weather update from Ham Nation. You can also learn more about WX6SWW on her website." The course outline for 2019's Contest University has been posted on the Contest University website. Scott, N3FJP, has updated his suite of logging programs for digital modes to include compatibility with VK3AMA's JTAlert software. He's also made significant changes to his State QSO Party programs. See his website for more information. Lance, W7GJ, hosts the VE7BQH Antenna Tables on his website. They were updated January 21, 2019, to include three new antennas in the 432 MHz listings, and along with more G/T figures for 50 MHz. Lionel, VE7VQH says "it is still a work in progress." HamSCI Workshop 2019 will be held March 22-23, 2019 at Case Western Reserve University in Cleveland, Ohio. 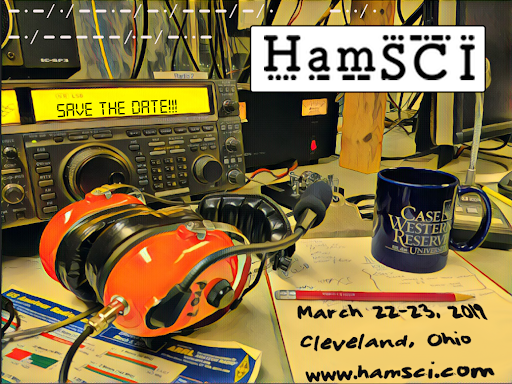 HamSCI Workshop 2019 is the place where professional scientists and the Amateur Radio community get to rub elbows. Among the topics to be discussed at this year's workshop are ideas and proposals for Personal Space Weather Stations, ground-based instrumentation that can be used to monitor the 2024 solar eclipse, and other topic areas related to Amateur Radio and science. The conference is March 22-23, 2019 at Case Western Reserve University in Cleveland, Ohio. For more information on how you can present, see the HamSCI call for papers, and for general information on the conference, see the conference website. Ed, W0YK, also announces that the annual Digital Contest Dinner, coincident with the Hamvention and Contest University activities, will be Thursday, May 16, 1800 local, at Spaghetti Warehouse, 36 West 5th Street, Dayton, Ohio. This is an "Informal dinner with digital contesting friends, and anyone is welcome." According to Ed, there may be a program. If not, it will be a social event. For more information, see this post in RttyDigital post on Groups.io. Flex Radio Systems has announced a new feature, multiFlex, which enables two operators to use a single Flex Radio Systems transceiver simultaneously. This has immediate applicability in the mult-1, multi-2, and multi-multi contesting categories where it's a common advanced strategy to use two or more operators to search and pounce and run a band at the same time. For more information, see the Flex Radio Systems website. A device used to combine two in-phase signals with very minimal loss. It's constructed as a 1.5 wavelength ring of transmission line with input ports located 1/2 wavelength from one another, and an output port located at 1/4 wavelength between them. The transmission line should have a characteristic impedance of 1.44 times the system impedance. For example, for 50 ohm sources and loads, transmission line with a 72 ohm impedance should be used for the ring. The full results for the 2018 ARRL Sweepstakes, CW and 2018 222 MHz & Up Distance Contest have been posted to the ARRL Contest Results website. The full results for the 2018 EME Contest are also available. Preliminary results from the January 2018 NAQP CW are available. The Contest Sponsors would appreciate an email if anything seems amiss. Regardless of how you feel about using FT8 for making contacts, you can use all of the activity and automated signal reporting to help understand what bands are currently open. You can become familiar with the pskreporter.info website, where an interactive map can show you various bands and paths that are open, relative signal levels, and so on. JA7UDE released an external driver program that allows the popular RTTY software MMTTY to perform FSK keying. With the addition of his program, and a little configuration, you'll be able to use K3NG's TinyFSK software with MORTTY hardware, or build your own. At HF frequencies, ice sheets are relatively transparent. Researchers exploit this characteristic to sound the surface of landmasses covered in ice using various towed-behind antennas and airplanes to determine the ice thickness. Anecdotally, radials for HF antennas placed on the surface of ice have been found to behave more like elevated radials. Researchers have demonstrated how to produce sound targeted at specific locations by exciting air molecules with lasers. The method is said to be precise enough to allow one person to hear the message, while another person in close proximity remains unaware. Radio contesting in 2019 is more about information management than ever before. For most competitors, maintaining situational awareness even in non-assisted competition categories involves stuffing the band map with heard and worked calls, understanding which stations are multipliers and which are not, watching the gray line for multipliers... all of which involve looking at information on at least one computer screen. Yesteryear's concept of a "boy and his radio" sounds wistful and romantic, but just try finding a major contest sponsor that will take a handwritten log for competitive entries. Today's "girl and her computer-controlled DSP radio, waterfall displays, and logger featuring multiplier windows, grayline displays, and call sign history lookups" is having a great time too, and she's got 2.7 times the number of points of the person who's writing down call signs using a pencil. This modern stuff is all she's ever known, but if she has a fit of nostalgia and uses the same setup 30 years in her future, it too will be in the "quaint" category. So you have to display a lot of information all at once. Paging through overlapping windows, or moving windows around to find things is as bad as an overcrowded, unorganized tool drawer. A solution to comfortably displaying all of the information at once involves using computer screens with more resolution. Just in time, mass production of 3840 x 2160 pixel monitors, also known as 4K HDMI Televisions, makes it possible to buy a basic 43-inch display using "24-bit color" for about $280. "Don't sit so close to the TV" used to be a thing if the pixels were really big, but LEDs have made "screen tanning" a myth of the past. It's all about the number of pixels per inch. If you're currently using a 21-inch 1920 x 1080 pixel "HD" monitor, it has 105 pixels per inch. The sizes of fonts, windows, and so on will look about the same on two monitors with the same PPI, so if you like how information looks in your current setup but just want more of it at the same viewing distance, you want a similar PPI for the new screen. A 4K 43" display has the same 105 pixels per inch, and it would definitely be more physically imposing when placed at the same distance from your eyes. You might have to move some gear around to fit it into your shack, but you'll have four times the amount of screen real estate! Go ahead, leave the Telnet window open while logging contacts! There are some caveats: Using most 4K TVs as a computer screen is adequate for a "radio pc" but not appropriate for serious first-person shooter (FPS) video games where characteristics like screen refresh rates or display latency are important. Since you're moving 4x the number of pixels, you will (probably) also need a new graphics card to drive the display using a new HDMI 2.x cable. You might have to adjust the TV's color settings to your liking, and tune some other settings. With more screen space, you can try other contest-related applications or try additional logger features that can improve your scores and build new skills, for example using a spectrum display to detect new stations faster and helping to find an empty spot to run. An expanded, downloadable version of QST's Contest Corral is available as a PDF. Check the sponsors' website for information on operating time restrictions and other instructions. CWops Mini-CWT Test, Feb 6, 1300z to Feb 6, 1400z and, Feb 6, 1900z to Feb 6, 2000z and, Feb 7, 0300z to Feb 7, 0400z; CW; Bands: 160, 80, 40, 20, 15, 10m; Member: Name + Member No., non-Member: Name + (state/province/country); Logs due: February 9. NRAU 10m Activity Contest, Feb 7, 1800z to Feb 7, 1900z (CW) and, Feb 7, 1900z to Feb 7, 2000z (SSB) and, Feb 7, 2000z to Feb 7, 2100z (FM) and, Feb 7, 2100z to Feb 7, 2200z (Dig); CW, SSB, FM, Digital; Bands: 10m Only; RS(T) + 6-character grid square; Logs due: February 21. SKCC Sprint Europe, Feb 7, 2000z to Feb 7, 2200z; CW; Bands: 160, 80, 40, 20, 15, 10m; RST + (state/province/country) + Name + (SKCC No./power); Logs due: February 14. NCCC RTTY Sprint, Feb 8, 0145z to Feb 8, 0215z; RTTY; Bands: (see rules); Serial No. + Name + QTH; Logs due: February 10. QRP Fox Hunt, Feb 8, 0200z to Feb 8, 0330z; CW; Bands: 80m Only; RST + (state/province/country) + name + power output; Logs due: February 14. NCCC Sprint Ladder, Feb 8, 0230z to Feb 8, 0300z; CW; Bands: 160, 80, 40, 20, 15, 10, 6m; Serial No. + Name + QTH; Logs due: February 10. CQ WW RTTY WPX Contest, Feb 9, 0000z to Feb 10, 2359z; RTTY; Bands: 80, 40, 20, 15, 10m; RST + Serial No. ; Logs due: February 15. SARL Field Day Contest, Feb 9, 1000z to Feb 10, 1000z; CW, SSB, Digital; Bands: 160, 80, 40, 20, 15, 10m; RS(T) + Number of transmitters + Category (see rules) + Province (or "DX"); Logs due: February 17. Asia-Pacific Spring Sprint, CW, Feb 9, 1100z to Feb 9, 1300z; CW; Bands: 40, 20m; RST + Serial No. ; Logs due: February 16. Dutch PACC Contest, Feb 9, 1200z to Feb 10, 1200z; CW, SSB; Bands: 160, 80, 40, 20, 15, 10m; PA: RS(T) + province, non-PA: RS(T) + Serial No. ; Logs due: March 15. SKCC Weekend Sprintathon, Feb 9, 1200z to Feb 11, 0000z; CW; Bands: 160, 80, 40, 20, 15, 10, 6m; RST + (state/province/country) + Name + (SKCC No./"NONE"); Logs due: February 17. KCJ Topband Contest, Feb 9, 1200z to Feb 10, 1200z; CW; Bands: 160m Only; JA: RST + Prefecture/District Code, non-JA: RST + Continent Code (AF,AS,EU,NA,OC,SA); Logs due: February 28. YLRL YL-OM Contest, Feb 9, 1400z to Feb 11, 0200z; CW/Digital, SSB; Bands: All; QSO No. + RS(T) + (section/province/country); Logs due: March 12. OMISS QSO Party, Feb 9, 1500z to Feb 10, 1500z; SSB; Bands: 160, 80, 40, 20, 15, 10m; RS + (state/province/DX) + (OMISS No. if member); Logs due: March 1. FISTS Winter Unlimited Sprint, Feb 9, 1700z to Feb 9, 2100z; CW; Bands: 80, 40, 20, 15, 10m; FISTS: RST + (state/province/country) + first name + FISTS No., non-FISTS: RST + (state/province/country) + first name + power; Logs due: March 11. RSGB 1.8 MHz Contest, Feb 9, 1900z to Feb 9, 2300z; CW; Bands: 160m Only; UK: RST + Serial No. + District Code, non-UK: RST + Serial No. ; Logs due: February 10. Balkan HF Contest, Feb 10, 1300z to Feb 10, 1700z; CW, SSB; Bands: 80, 40m; RS(T) + QSO No. ; Logs due: February 17. 4 States QRP Group Second Sunday Sprint, Feb 11, 0100z to Feb 11, 0300z; CW, SSB; Bands: 160, 80, 40, 20, 15, 10m; Member: RS(T) + (State/Province/Country) + Member No., Non-member: RS(T) + (State/Province/Country) + Power; Logs due: February 13. CQC Winter QSO Party, Feb 11, 0100z to Feb 11, 0259z; CW; Bands: 80, 40, 20m; RST + (state/province/country); Logs due: March 13. ARRL School Club Roundup, Feb 11, 1300z to Feb 15, 2359z; CW, Phone, RTTY/Digital; Bands: All, except 60, 30, 17, 12m; RS(T) + Class (I/C/S) + (state/province/country); Logs due: March 2. NAQCC CW Sprint, Feb 13, 0130z to Feb 13, 0330z; CW; Bands: 80, 40, 20m; RST + (state/province/country) + (NAQCC No./power); Logs due: February 16. QRP Fox Hunt, Feb 13, 0200z to Feb 13, 0330z; CW; Bands: 80m Only; RST + (state/province/country) + name + power output; Logs due: February 14. Phone Fray, Feb 13, 0230z to Feb 13, 0300z; SSB; Bands: 160, 80, 40, 20, 15m; NA: Name + (state/province/country), non-NA: Name; Logs due: February 15. CWops Mini-CWT Test, Feb 13, 1300z to Feb 13, 1400z and, Feb 13, 1900z to Feb 13, 2000z and, Feb 14, 0300z to Feb 14, 0400z; CW; Bands: 160, 80, 40, 20, 15, 10m; Member: Name + Member No., non-Member: Name + (state/province/country); Logs due: February 16. RSGB 80m Club Championship, Data, Feb 13, 2000z to Feb 13, 2130z; RTTY, PSK; Bands: 80m Only; RST + Serial No. ; Logs due: February 14. PODXS 070 Club Valentine Sprint, Feb 14, 0000z to Feb 14, 2359z; PSK31; Bands: 160, 80, 40m; Name + (OM/YL) + (state/province/country); Logs due: February 28. NCCC RTTY Sprint, Feb 15, 0145z to Feb 15, 0215z; RTTY; Bands: (see rules); Serial No. + Name + QTH; Logs due: February 17. QRP Fox Hunt, Feb 15, 0200z to Feb 15, 0330z; CW; Bands: 80m Only; RST + (state/province/country) + name + power output; Logs due: February 21. NCCC Sprint Ladder, Feb 15, 0230z to Feb 15, 0300z; CW; Bands: 160, 80, 40, 20, 15, 10, 6m; Serial No. + Name + QTH; Logs due: February 17. ARRL International DX Contest, CW, Feb 16, 0000z to Feb 18, 0000z; CW; Bands: 160, 80, 40, 20, 15, 10m; W/VE: RST + (state/province), non-W/VE: RST + power; Logs due: February 24. SARL Youth Day Sprint, Feb 16, 0800z to Feb 16, 1000z; SSB; Bands: 40m Only; RS + age; Logs due: February 23. Russian PSK WW Contest, Feb 16, 1200z to Feb 17, 1159z; BPSK31, BPSK63, BPSK125; Bands: 160, 80, 40, 20, 15, 10m; RU: RST + 2-letter oblast, non-RU: RST + Serial No. ; Logs due: February 22. Feld Hell Sprint, Feb 17, 1900z to Feb 17, 2059z; Feld Hell; Bands: 160, 80, 40, 20, 15, 10, 6m; (see rules); Logs due: February 20. AWA Amplitude Modulation QSO Party, Feb 16, 2300z to Feb 17, 2300z; AM; Bands: 160, 80, 40, 20m; Name + (state/province/country); Logs due: March 9. Run for the Bacon QRP Contest, Feb 18, 0200z to Feb 18, 0400z; CW; Bands: 160, 80, 40, 20, 15, 10m; RST + (state/province/country) + (Member No./power); Logs due: February 24. QRP Fox Hunt, Feb 20, 0200z to Feb 20, 0330z; CW; Bands: 80m Only; RST + (state/province/country) + name + power output; Logs due: February 21. Phone Fray, Feb 20, 0230z to Feb 20, 0300z; SSB; Bands: 160, 80, 40, 20, 15m; NA: Name + (state/province/country), non-NA: Name; Logs due: February 22. CWops Mini-CWT Test, Feb 20, 1300z to Feb 20, 1400z and, Feb 20, 1900z to Feb 20, 2000z and, Feb 21, 0300z to Feb 21, 0400z; CW; Bands: 160, 80, 40, 20, 15, 10m; Member: Name + Member No., non-Member: Name + (state/province/country); Logs due: February 23. See NCCC Sprint Ladder, Feld Hell Sprint, SKCC Weekend Sprintathon, above.